What speaks to you of summer? Doreen said it so perfectly last week. For many, summer is swimming along sandy shores in salt water ... camping by clear mountain lakes ... picnicking in the woods ... biking and hiking ... reading stacks of books ... staying up late to watch the stars in the night sky ... spending time with family. For us foodies, it is eating food fresh from the field, whether your own or a local farmer's. The inspiration for this particular entry comes from fellow blogger Magda of My Little Expat Kitchen. Her entry last week for Cherry Tomato Jam sent me directly to the St. Philip's Farmers Market to buy some fresh heirloom tomatoes – Brandywine variety. Without her entry I might have forgotten that tomato season is upon us and that there is no time to be wasted! Eat them while you can, I say, and in whatever fashion makes for your quintessential summer meal. For Mark, it is simply slices of tomatoes still warm from the garden sprinkled with salt and pepper. 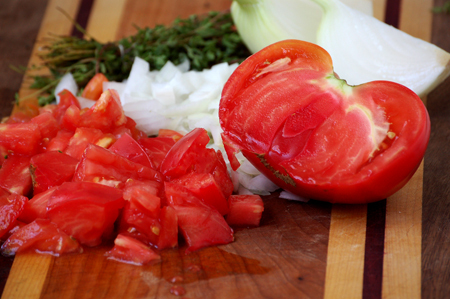 For my friend Marylou, it is tomato sandwiches eaten over the kitchen sink, summer's juices flowing down her arms. For friend Susan it is a BLT on homemade white bread with thin slices of avocado. 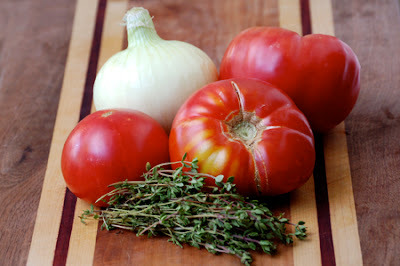 For Mark and me, when we lived in Maine, it was a summer salad of fresh tomatoes, corn-off-the-cob, lobster and basil – a combination of flavors to make your knees weak. But in my youth, it was my mother's tomato soup, hold the grilled cheese sandwich please! 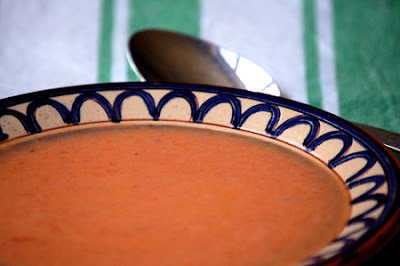 Never have I had a tomato soup as simple and as pure as this one. 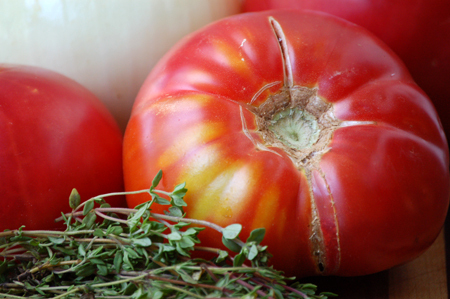 The flavors of thyme, parsley and bay are perfect compliments for the sweet, juicy flavor of garden-ripe tomatoes. And water is the only stock you will need; the tomatoes speak for themselves. I once tried making this with "vine-ripened" tomatoes out of season. I shouldn't have – I should have known better – and I implore you not to either. This is one of the true "eat local and in season" lessons that makes the concept ring loud and clear. It has gotten to the point where, out of season, I only eat (hydroponic) cherry tomatoes and feel fortunate that their flavor is quite full and sweet, considering their provenance. Mom made her soup with tomatoes we grew in our back garden and, when our plants were not producing enough, she augmented the pile with those from area farm stands. 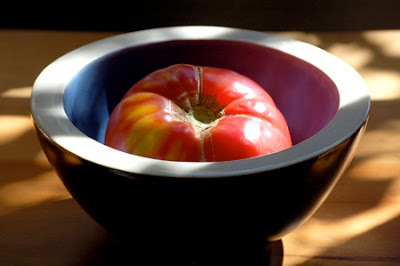 I know she loved fresh tomatoes, and I am sure she made other things with them, but I remember only this soup from summer to summer. She would freeze batches before adding the cream and, sometimes, she wouldn't even add the cream at all. When a frozen batch was thawed in late winter for a noon meal, summertime memories would come flooding back and the promise of summer's return was bright on our tongues. Someone once asked me if I thought this was a waste of fresh tomatoes. Honestly, the thought had never occurred to me and my answer was a quick, "No!" Something that makes me this happy can't be a waste. I hope you get a chance to try this soup over the summer – and I would love to hear what you think. In a soup kettle, over medium-low heat, melt the butter and cook the onion until soft – about 10 minutes. Stir in flour until blended and cook 1 minute. Slowly stir in water. Add tomatoes and remaining ingredients except cream, and cook over medium-high heat until the soup comes to a boil. Reduce heat, cover loosely, and simmer for 30 minutes, stirring frequently. At this point the soup needs to be puréed and strained to remove tomato skins and seeds. I put it through the fine disk of a food mill, but it can be blended and put through a fine-mesh sieve. Either way, strain into a clean pot, add cream (if using) and heat until almost at a boil. Serve with a lemon slice, if desired. Makes 8-10 cups. As I mentioned, it freezes well before cream is added. Recipe can be halved, as well. Your soup looks amazing David and I love the look of the tomatoes you picked.They look so juicy! You know, even though I use tomatoes all the time, in salads, sauces, sandwiches, I've never made tomato soup. I have to give this a try! Thank YOU for the inspiration, Magda! I can assure you that this soup will change the way you think of tomato soup. If you skip the cream, it makes a great chilled summer soup!